Today, May 23rd, in San Salvador, is the beatification of Archbishop Oscar Romero. I was living in St. Joseph’s House of Hospitality Catholic Worker in Rochester, NY when I first encountered his works and life. It was there I read The Violence of Love and watched Romero. 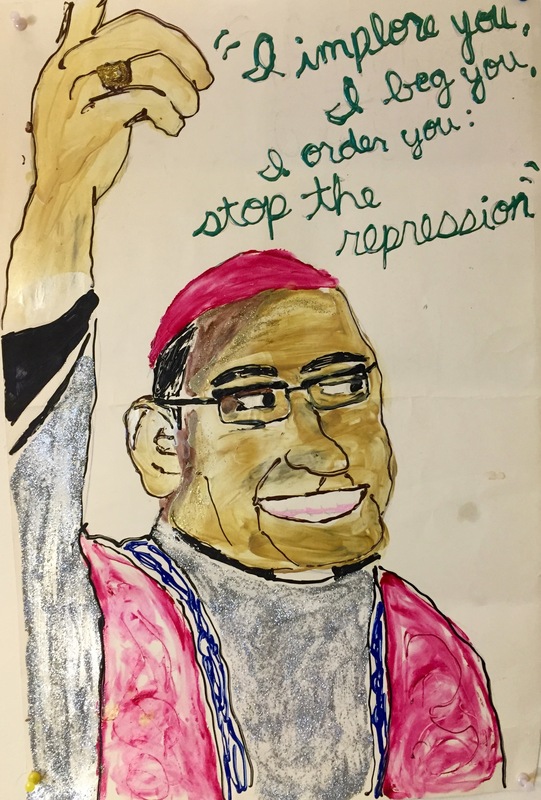 Oscar Romero spoke out for justice and called out the El Salvadoran government for their violence and even wrote to President Carter asking him to stop sending military aid. He would often say, “I do not believe in death without resurrection” and “If they kill me, I will be resurrected in the Salvadoran people.” Romero cared deeply for the poor and challenged oppressive systems. and call out injustice wherever it may be found. A wonderful friend created this for me and it hangs in my bedroom.